With opposition leader Sam Rainsy leaving the country hours after guilty verdicts were suddenly handed down against the activists last Tuesday, Mr. Sokha has been left to lead the CNRP’s campaign to free the 11 men. Following his visit, Mr. Sokha told reporters outside Prey Sar that he hoped the sentences could be overturned either by legal appeal or enforcement of last year’s July 22 political deal. “I told them that they are not alone. 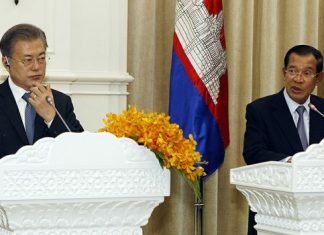 Cambodian people around the whole world are interested and support them, and some [international] powers will help to find justice for them,” he said. The deputy opposition leader questioned the legal processes that led to the sentences being handed down against the activists in the absence of all but one of their lawyers, who were protesting a decision to fast-track the trial. 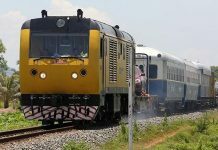 Mr. Sokha said that such a decision would be in line with the current “culture of dialogue” born of last year’s political agreement, which ended the CNRP’s almost yearlong parliamentary boycott and public protests. That agreement came a week after the violent protest at Freedom Park on July 15, over which 11 opposition activists were sentenced for “insurrection,” and for which seven CNRP lawmakers-elect were briefly imprisoned. “Both parties say we still keep the spirit of the political agreement, so that means they can be released by the spirit of the political agreement,” Mr. Sokha said. Prime Minister Hun Sen, however, said Monday that he would not discuss the court case in a political context, noting that the sentences were relatively light for insurrectionists. 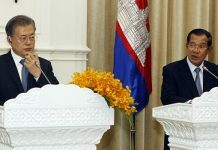 “I don’t want to take this forum to talk about a political story, although there are repeated issues occurring and there is somebody appealing to me to have discussions with this or that person,” Mr. Hun Sen said in a speech at Wat Botum pagoda. “I would like to give back a request: Please, do not create more stories, [because] for the matters of law and the courts, let the law and the courts settle it, so the politicians should not get mixed up in this matter,” he added. “For me, anybody can meet with me, except terrorists. But if [they] talk about the court, that is outside my power,” Mr. Hun Sen said. “Leading insurrection is punishable from 20 to 30 years, but they were only sentenced to 20 years, a very light sentence,” he said of the three CNRP officials found guilty of leading the insurrection. “Those found guilty of participating in an insurrection can be punished with up to 15 years in jail. But they were given very light prison sentences of seven years in jail,” he said of the remaining eight activists. The prime minister went on to question “foreigners” who have criticized the decision. Numerous international human rights groups have blasted the guilty verdicts as political maneuvering by the ruling party. During Monday’s visit to Prey Sar, Mr. Sokha was joined by 10 fellow CNRP lawmakers, including Long Ry, Ho Vann and Nuth Rumduol, three of the seven lawmakers who were jailed for a week following the July 15 protest. Like the other four lawmakers charged with “leading an insurrection” over the protest, the trio gained parliamentary immunity from prosecution when they accepted their seats in the National Assembly in early August. Yet the charges still hang over them and court officials have remained vague on the status of the case, at times suggesting that they could still be prosecuted due to the fact the charges were laid before they gained their immunity. At the prison, Mr. Ry, Mr. Vann and Mr. Rumduol said they were refused entry to visit the activists due to the fact that they have criminal charges pending against them. Sam Sokong, the lawyer for six of the 11 activists, said he visited his clients at Prey Sar on Friday and planned to file an appeal based on the issues outlined by Mr. Sokha. “The reason we will appeal will be to annul [the decision] based on the procedures of the trial, and secondly that the court sentenced my clients to very serious punishment,” he said. Choung Choungy, the lawyer for the remaining five activists, said that he filed an appeal for his clients on Friday.